December's birthstone, turquoise was among the first gemstones ever mined. Stunning sky blues to stimulating sea greens have made turquoise one of the most popular color trends in jewelry history. Copper gives turquoise its range of blue hues while iron is responsible for its green colors. Treasured since the days of ancient Egypt, and the thousands of years since, turquoise is said to bring good fortune and happiness to those who wear it. Light To Medium Blue, Greenish Blue To Green, Often Mottled With Brown, Dark Gray, Black Veins. The appearance of turquoise is a primary clue to its identity, especially if a recessed matrix is observed. Other key separations are its refractive index (using a spot reading or distant vision method), spectrum and possibly fluorescence. 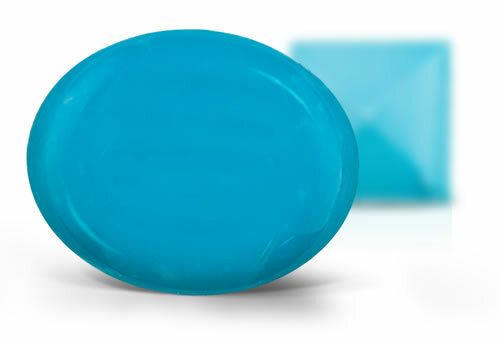 Persian turquoise is an intense, robins egg or sky blue from the Nishapur district of Iran. Stones tend to have a low porosity and take a good polish. Persian turquoise has less dark veining than turquoise form other areas and might have white patches. It is considered to be the best quality of turquoise.Most American or Mexican turquoise is a by product of copper mining. Stones are generally light blue, greenish blue to blueish green and have can have a brown matrix and it is somewhat porous. The Sleeping Beauty Mine turquoise was light blue in color with very little veining. Egyptian turquoise has been depleted but antique stones will have a greenish blue to yellowish green color. Spiderweb turquoise has thin lines of matrix in web like patterns. Turquoise is a alternate birthstone for December. Turquoise often has brown, gray or black matrix that is sometimes recessed below the polished surface of the stone. Stone may contain pyrite or calcite inclusions.